Kudos to WOR710 for softening the blow for one fan forced to miss the Opening Day ceremony prior to the Mets’ 6-0 win vs. Atlanta. 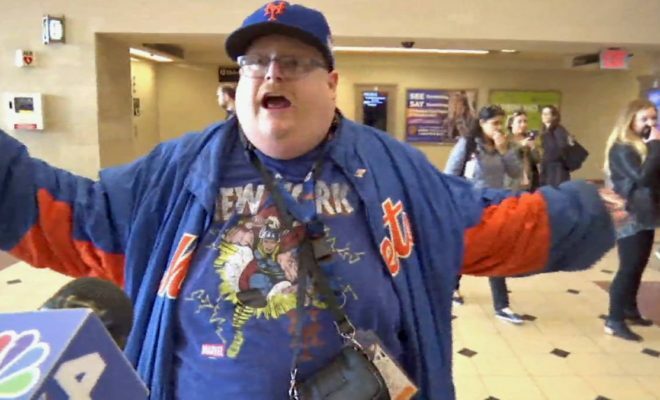 New Jersey Met fan Frank Fleming was especially furious, and he expressed his frustration with NBC. If you haven’t seen it, it’s a must watch, and you can find it here. To ease the pain, WOR has offered Fleming tickets to an upcoming game, as well as the chance to meet the lead radio team of Howie Rose and Josh Lewin. The Sports Zone’s Pete McCarthy recently spoke to Fleming about the incident. You can hear his remarks below.